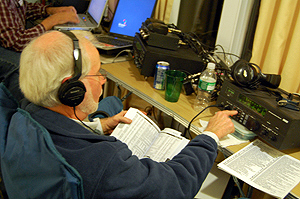 For Long Beach Island DXpeditions from 2004, check out DXing.info DXpeditions page. Previous years' results and more pictures can be found on Radiodxing.com. 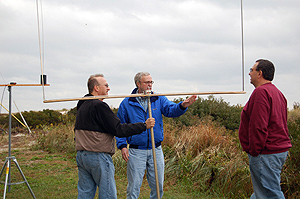 Our antenna deployment on Friday went well this year, with no interruptions by the local police or curious fishermen. We had once again taken the precaution of sending a letter (on ARRL stationary, since many of us are hams) to the local city government ahead of time to alert them of our activities, and were able to get the beverage-on-the-ground antennas (BOGs) deployed before the rains came. The standard 750' EuroBOG (at 33 degrees) and 900' Southern BOG (at 213 degrees) were laid out along the base of the dune fence and buried at the vehicle and footpath crossings. When we were rolling up the BOGs on Sunday, we discovered one place where a BOG was pulled out and exposed by someone at a crossing creating a tripping hazard, but there were no breaks in either wire this year. Once again, the BOG's fan terminations appeared to provide the required grounding as directionality of north vs. south wires was noticeable. 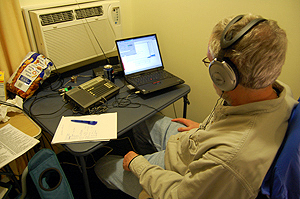 One new "toy" at this year's DXpedition was an RFSpace SDR-IQ software-defined radio. These small computer-controlled boxes are making inroads around the DX community, and introduce a new way to "look" at DXing. One obvious benefit of the SDR was the ability to "see" the carriers of trans-atlantic stations and observe the strength of the signals increasing and decreasing as conditions changed. Another benefit was the ability to record ~190 kHz of bandwidth for later review and analysis. I predict these radios will play a larger role in the hobby in the future. On Saturday, we put out the broadband loops, and this year was the debut of Bruce Collier's 7-foot alumiloop BBL, fabricated on-site from aluminum windowframe hardware. The alumiloop was deployed at a bearing of 130/310 degrees, while our other BBL (a Mark Connelly-designed 6') was aimed at 80/260 degrees. Both loops were amplified with DX Engineering RPA-1 16 db pre-amps (one with a single amp and the other with two cascading amplifiers) and the consensus of the group was that the loops provided as good, if not better, signal levels compared to the BOGs and reduced the annoying television interference (TVI) levels considerably. We may rethink our use of BOGs in favor of BBLs in the future, as they are much easier to deploy. We tracked the solar conditions for several months prior to the DXpedition and all signs pointed to low numbers; on Friday both A and K indices were at 1 while on Saturday A spiked up to 5. However, the consensus of the group was that the conditions this year were very middle-of-the road, with no real standouts other than Saturday night's good reception of Iceland on 189 kHz. While the trans-Atlantic stations started to appear as early as 3:45 PM EST, reception both nights was mediocre, although our logs totaled nearly 30 countries on LW and MW. No sign of TP signals, once again, despite our trying early in the mornings. The biggest change this year was the closure of the Greenhouse Cafe (our normal breakfast location) due to renovations, which led to us to discover another (even better?) restaurant, ScoJo's, a few blocks down the beach (billed as the best breakfast spot on LBI). Once again, we had many interesting discussions on topics like AM radio, IBOC, our best receptions, and personalities in the radio hobby over waffles and breakfast skillets. LBI-6 is one for the books, and I look forward to next year! 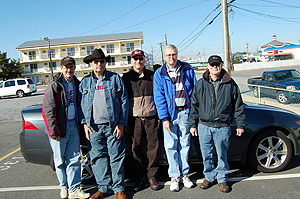 Once again the Drifting Sands Motel cheerfully welcomed the radio guys as we transformed room 126 into the DX Inn for LBI-6. I dont think they quite understand us, but we cause no trouble, we bring $$$ to the beach in November, and we pretty much clean up after ourselves, so they seem happy enough to rent to this strange bunch. Unlike the Newfie gang who saw their former DX Inn go downhill to being unusable, our DX Inn has actually improved from a bare-bones weather-beaten beach motel that in 2002 browned out to 82 volts(!) into a remodeled version with a new third floor and internet service. Its nice to have internet, but with that and all the new RCA TVs which probably arent as well made as the old ones, TVI/hash has become a real problem. My noise floor was about s3-s7 much of the weekend. Some channels were unusable; others could be used in USB or LSB only, depending on which side the hash was. Brett had brought a couple of John Bryant-designed noise reducing transformer boxes, and these did seem to help on the BOGs a bit. Relocating is tough---we all agree nowhere else in NJ will be better. And if you go south, you start to lose TA strengthnorth and you get into the NYC RF jungle. Setup was smooth with good weatherno curious police or other distractions. Also, due to career moves and conflicts, we only had 5 DXers this year, so we could use just one radio room, eliminating a set of splitters and cables for the 2nd room. As for conditions, Id say "fair". Ive been here when there were NO TAs (2003) and when there was something on every channel (2004). This likely ranks 3rd out of the 6 LBIs so far. My personal highlight was finally hearing Iceland 189 with good audioa first in 30 years of Dxing! We did have some interesting moments, such as 2-3 stations fighting on 1215, one of which we believe was the Russian. Conditions rose and fell quite often; I think with less TVI, Id have been able to snag Russia on LW, but it was tough down thereso bad that I didnt even beacon chase much. 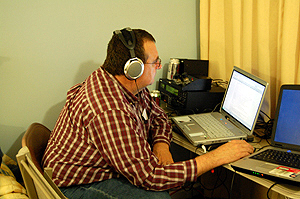 Chatting online with Marc DeLorezno who had been at a Cape Cod DX GTG at Chris Blacks the same Saturday, they found conditions mediocre as well. Our usual breakfast spot was closed for renovations, but we found a good 2nd choice. Bill Harms was kind enough to stop at the Manahawkin Pizza Hut and pick up Fridays dinner as he arrived later than the rest of us, and we found out Subway on LBI is closed Saturday night---but the Wawa mini-market nearby turned out decent subs, so we didnt starve. All in all, another fun weekend with good friends, food, and DX. Beats a good day at work! With 6 LBI DXpeditions now in my rearview mirror, I can say that weve had great conditions ( 2005 ), very good conditions ( 2006 ), average conditions ( 2007 and 2004), auroral conditions ( 2002) and just plain poor conditions ( 2003 ). 2006 had our largest number of participants  8, while 2007 tied for the smallest  5. Weve certainly become much more adept at setup, organization and breakdown, and weve collectively ( although the lions share still comes from Saylor Electronics ) acquired a solid collection of splitters, amps, matching transformers, coax, coax switches, plugs and adaptors. Along the way, weve added BBLs to the mix, a wireless router, the DX chatroom, and the webcam. This year also yielded more audio recordings as well. The ability to DX in concert with others via email and the chatroom on both sides of the Atlantic during the weekend also enhances the experience and also adds some efficiency. We considered adding a 3rd day for this years event, but in retrospect, wed not have had good enough DX conditions to support it  especially had we added the extra day at the end, as the geomagnetic indices spiked again on Monday  something thats happened a couple of times before. And this years experience certainly proves that while the best advance planning in tracking solar activity for the prior 3 months yielded optimum numbers, that still didnt yield the expected results. As has been noted, we spent considerable time talking about alternate sites, but given the limitations imposed by proximity to New York, lengthening the TA paths or lack of direct access or even accommodations on the beach, coupled with some greatly-increased travel times, weve decided to continue where weve been, but to work toward minimizing the effects of the inevitable TVI by going for more and better BBLs. Bottom line, though, its still the overall experience that counts the most, with annual reunions of friends gathering to DX, share memories, play DX recordings and talk DX. 570 0356 CMDC R. Reloj, Santa Clara CUBA, Code "RR"
585 2147 RNE1, Madrid Spain, Parallel 685, 855 etc. 684 2146 RNE1, Sevilla Spain, // 585, 855 etc. 760 0100 HJAJ RCN Barranquilla Colombia Talk by M and W in SP, RCN jingle, bank ad, mentions of futball, Colombia; another Latin hrd under. WJR phased completely out. 850 0412 CM.. R. Reloj Nueva Gerona CUBA Code "RR"
855 2148 RNE1 Murcia Spain Parallel 585, 684 etc. 870 0414 CMDT R. Reloj Sancti Spiritus CUBA Code "RR"
1152 0229 unID UK Oldies music, English annct "This is the Sound"
1575 2245 Radio Farda ,Al Dhabiya UAE, Fair strength with pop music and talk; // webstream.